Dr. Jimmy Wu has taken a truly innovative and unique approach to the design of his dental practice in the La Mesa and San Diego area, and he wanted his new website to reflect those qualities. The team here at Rosemont Media recently collaborated with Dr. Wu to create a new, responsive dental website for Sutra Dental Spa incorporating some of the latest design technologies and comprehensive content that gives viewers a beautiful virtual tour of the practice. Throughout the site, Sutra Dental Spa announces itself as something different. The selection of office photos midway down the Home page automatically rotates across the screen, giving the viewer a detailed look at the many ways Dr. Wu has tried to make his office as relaxing, inviting, and comforting as possible. Right at the top, you’ll find the “Sutra” logo, which is a virtual copy of Dr. Wu’s business card. We were able to beautifully recreate the gold shimmer and eye-catching aesthetics in a digital format. Plus, the navigation is what’s called “fixed” nav, a term that describes a navigation bar that stays at the top of the page even as the viewer scrolls down, making it easier to find what he or she is looking for at all times. The header graphics on the inside pages are actual photos from the office, which can provide online visitors with constant reminders of what they can expect from a visual standpoint inside Sutra Dental Spa. In addition to pages describing procedures such as porcelain veneers, teeth whitening, dental implants, Invisalign®, sedation dentistry, and other advanced procedures, Dr. Wu’s new website includes a patient testimonials page, a before-and-after photo gallery, and a biography of the dentist. The responsive design of Sutra Dental Spa’s new website makes it easily readable and accessible across multiple digital platforms, including desktop computers, smartphones, tablets, and laptops. This type of design is crucial in the mobile age, giving viewers a comprehensive look at what a practice offers without sacrificing content or ease-of-use. The new site is also optimized with original content and the latest dental SEO strategies to help Sutra Dental Spa attain the highest rankings possible on search engines. Please take a look at Dr. Wu’s new website at www.sutradentalspa.com. 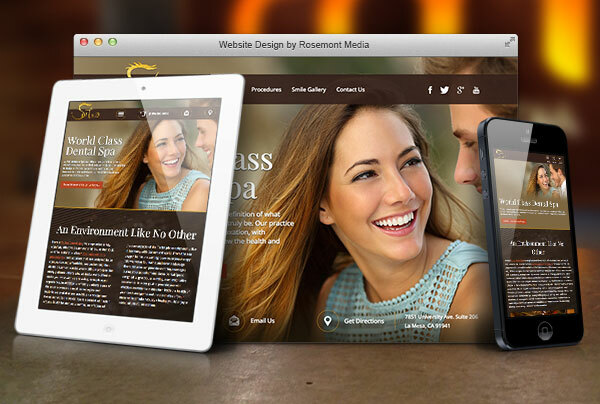 If you are thinking about developing a new website for your practice, redesigning an old one, or simply improving your site for better performance, please contact Rosemont Media today.